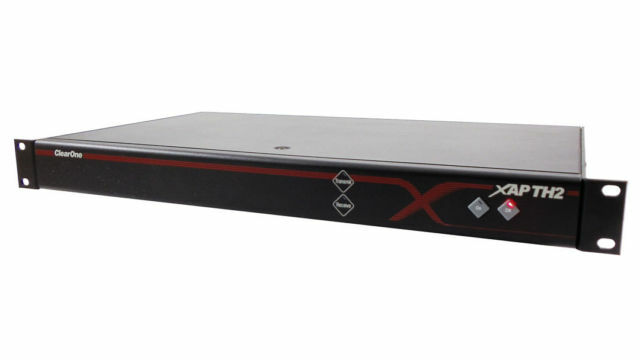 The Clear One XAP TH2 Telephone Interface is a single-line digital hybrid which uses digital signal processing (DSP) to separate the transmit and receive audio, eliminating distortion, weak signals, and feedback. It continually filters low and high frequency noise to provide pure sound. The XAP TH2 is designed to function as a stand-alone telephone hybrid or as an accessory to the XAP 800 (echo cancelling, audio processing, microphone mixing matrix), enabling you to add remote callers to your audio conferences. with the deepest, most reliable hybrid null. Balanced line-level input and output. Touch-tone dialing capability (40 character dial string). Full-time telco echo cancellation with 31 millisecond tail time. ?Conference up to 16 callers (with 16 XAP TH2s) within a XAP 800 system. ?Adjustable audible connect and disconnect tones. ?Selectable caller automatic level control (ALC). Adjustable dial tone, DTMF attenuation. ?Continual adaptation to telephone line conditions. ?Digital anti-alias filter to minimize hum and Central Office switching noise. Compatible with analog telephone lines. ?remote control device via expansion bus or RS-232 port.